When I passed by Gary's tent, he waved me in closer. "Do you know anything about that tree by the avalanche chute?" "You mean that one that fell during the night?" "I thought you might. We were a bit perplexed when we got down and it was already gone!" I didn't ask how he knew it was me--I assumed he figured it out from a process of elimination. There weren't many people who had the tools and opportunity to have done the work, but it made me smile to imagine them trying to figure out how the tree managed to cut itself out of the way. =) Gary thanked me for the unexpected help and I moseyed along. Ken scouted the PCT to the south and found three more fallen trees on our side of a washed-out bridge, trees that one team would cut out in the morning before we quit for the day. I set up my tarp due to threatening-looking clouds, but by the time I went to sleep, the skies had cleared so I unhooked one-half of it and folded it back along the other half. If it did start raining during the night, it would be relatively easy for me to reattached the loose side. It didn't rain, though, and I enjoyed the stars during the night. The next day, we took our time getting up. One team set off to clear the PCT of the fallen trees to the south while the rest of us fixed up the trail back to the trailhead for Pete Lake. Most of the work everyone did was cutting back the vegetation, but I carried the grub-hoe this time and worked on water drainage issues. 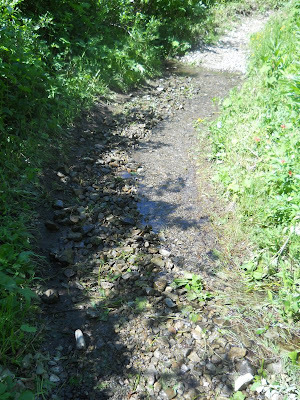 Along the Pete Lake trail, there were some big problems with water not draining properly off the trail. Some of the issues were far too big for one person to fix quickly--our goal was to get back to the trailhead by 1:00 in the afternoon. And since I had the only grub-hoe in our group, I couldn't really expect much help. Handsaws and cross-cut saws generally aren't suitable tools for digging water drains. Everyone, including the team that was originally behind us to cut out the three logs across the PCT, managed to pass me while I played in the mud. In one place, water ran about 30 feet down the length of the trail before it drained off into a meadow. There wasn't an easy or quick fix for this problem. The trail was so worn, it fell several inches below the surrounding terrain. With enough time and effort, I could have dug out a drainage where the water could cross the trail without running down it, but I didn't have enough time for that. 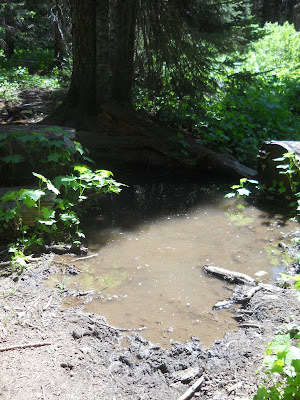 So instead, I found a low point where the water could almost get off the trail and dug out that section. The water still drained down about 10 feet of the trail, but that's still a big improvement over the 30 feet of trail it had been running across. Another area had water running down about 15 feet of trail, but I couldn't see any quick or easy fixes for that. The trail was just worn down too deep. So I made a quick temporary fix, pushing up a lot of the rocks and debris on one side of the trail to the other side of the trail. This gave the water a channel on one side to flow down the trail and a dry area where hikers could travel on the other side. Not ideal, and it's certainly not a permanent solution, but at least it'll make things marginally better for anyone hiking the busy trail. So I dug water drains, in mud and rocks, trying to do what I could to keep water off the trail. The Pete Lake Trail is in bad shape--a WTA work party could spend a week fixing up the water drainage issues along this short section of trail. As busy as it was, I felt that more turnpikes really needed to be installed. And the trail was busy--extremely busy now that it was a weekend. I passed dozens of people, three groups of people riding horses, half a dozen dogs, and--most unexpectedly--two goats. I'd never seen anyone take their goats out for a walk before, and they were so adorable! The goats were in training to carry loads, but they weren't carrying anything this year. This year was about teaching them how to hike on trails, cross streams, and get comfortable with their surroundings. The next year, the owners told us, they'd start carrying loads. I finally reached one of the biggest pools of water sitting on the trail and at a cursory glance, I thought I could make a big improvement here. The pool of water looked like it was a good three or four inches deep in the middle and it spanned the entire width of the trail. A saw large frogs swimming in the water. A small berm on one side seemed to hold the water in place preventing it from draining downwards off the trail, and I thought if I could just knock enough of that berm down, most of the water would drain right off the trail. The deepest part in the middle probably wouldn't, but I wasn't looking to fix the problem--just make it a little less bad. If I could drain it enough so people could walk along the side of the trail, it would be a huge improvement. As it was now, an entirely new path was forming cutting the turn in the trail off completely. I went to work with the grub-ho, splashing mud and water all over myself, and started seeing the water draining of the trail into the marshy area. I was quite proud of this, and stood up on a log nearby which when I noticed that there was water draining into the trail from the other side of the log. The level of the water in the pool wasn't going on at all--I'd just created a current that hadn't been there before. It wasn't a fast current, but the water was coming from a stream that ran into this log--a solid wall that the water couldn't go through, and so the water did what water does--it drained around the log. The berm had trapped the water from draining on the trail side, so it pooled up then went around the other side of the log. Now that I cleared out the berm, the water was slowly going around both sides of the log now. I needed to block the channel where water was getting into the trail--but I didn't have the time to fashion a solution. Drats. My biggest earth-moving project on the trip came to a screeching failure. I cut my losses and continued the hike out to the trailhead. I hiked fast, no longer doing any trail work at all, trying to catch up with the rest of the group, asking people hiking in the opposite direction how far ahead of me they were located. I only managed to catch up with Gary before I reached the trailhead, but I was glad that I wasn't bringing up the rear and had everyone waiting on me. I didn't have a ride scheduled to get me home from this point. My plan was to hitch a ride from anyone heading towards Seattle, and Joanna offered to give me a ride to the Bellevue Park and Ride. Perfect! Had nobody been heading towards Seattle, I did have a Plan B: I'd spend the next two days hiking south on the PCT to Snoqualimie Pass where Amanda would pick me up. =) As much as I'd have loved to hike to Snoqualmie Pass, I didn't really have time--I needed to get a lot done before I left town for nearly four months in just a few more days! But I had brought two days of extra food.... just in case. So we all said our goodbyes and headed our separate ways. I hopped into Joanna's vehicle, and she drove me to Bellevue, where I picked up a bus that took me into downtown Seattle, where I transferred to another bus that took me home to West Seattle. In related news, please help support WTA trips like this one by sponsoring me for WTA's annual Hike-a-Thon! Public art at the bus stop in Bellevue.